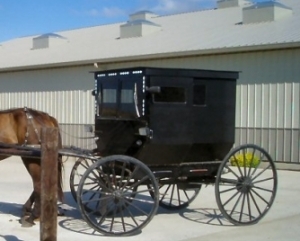 Searching for Amish furniture in Illinois? The Land of Lincoln is a bona fide Amish heartland. With a large Amish population and an entrepreneurial tradition, Illinois’ Amish create a wide range of home furnishings including cabinets, office furniture, bedrooms, entertainment centers, outdoor furniture, and much more. Dozens of IL businesses offer Amish-built furniture. Chicago buyers have a range of choices in the Chicagoland area. Those willing to trek a bit further can make the trip to Arthur, a short drive from Springfield, Decatur, and the Champaign/Urbana area, and reachable in a day trip from Bloomington and Peoria. Arthur in central Illinois is home to the largest Amish population in the state and is a hotbed of Amish woodworking, cabinetmaking, and furniture production. Retail outlets can also be found scattered elsewhere across Illinois. Amish cabinet maker in addition to doors. Cabinet manufacturer in addition to counter tops. Array of Illinois-made Amish furniture including Mission tables, chairs, and hutches, Queen Anne, dressers, end tables, gun cabinets, roll top desks, bedroom suites, entertainment centers, and more. Custom-made furniture as well as standard line of showroom pieces. Amish-made brand created by a network of Amish furniture workshops, sold by retailers around the country. Dining and Living Room, Children’s and Office furniture lines. Illinois Amish-made hardwood tables, beds, office suites, children’s nursery furniture, living room loveseats, sofas, occasional chairs, and more. Full furniture line plus made-to-order pieces. Local Amish furniture in nearby Arcola. Woods used include cherry, hickory, oak, quarter-sawn, maple. Store also features hand bags, quilts, Amish foods (popcorn, jams, jellies). 10,000 square-foot showroom of Amish-made benches, bedrooms, children’s toys, jewelry chests, entertainment centers, etc. Retails Amish-made chimes as well as “Care-n-Share” baskets made by physically challenged Amish people. Range of Amish-crafted furniture including mirrors, bookcases, tables, rockers and gliders, TV stands, kitchen accessories, and more. Rockford location of Simply Amish furniture network. “Illinois’ oldest Amish furniture store”. Office, children’s, bedrooms, dining rooms, cabinets and curios, more. Solid-wood construction, custom-made available. Amish crafted bedroom sets, office suites, kitchen and dining pieces, rockers, benches, cabinets, and more. Handcrafted hardwood Amish furniture. Chairs, tables, beds, accessories, more. Hutches, gliders, benches, rockers, kitchen accessories, home office pieces, clocks, barstools. Custom-design kitchens working in tandem with an Illinois Amish mill shop. Antioch location of the Simply Amish umbrella of stores. Custom cabinetry, also sells furniture. Advertised woods include oak, quarter-sawn oak, maple, pine, alder, ash, and more. Range of finishes, and styles including Queen Anne, Shaker, Mission. Amish Furniture and More, Inc.
We sell quality Amish and Mennonite Furniture for every area of your home. Have your choice of quality woods and stains. Visit our website to see our beautiful collection. Champaign outlet of Simply Amish furniture chain. Carries the Simply Amish furniture brand. “Heirloom quality” furniture from Amish in Eastern Ohio. Large 20,000 foot Illinois showroom. Solid wood, no pressed wood or particle board used. Home and office furniture made by Amish craftsmen. Hardwood construction. Living rooms, dining rooms, curio cabinets, children’s furniture, loveseats, chairs, computer centers, office suites, Amish-made loft systems and residence hall furnishing for college students, more. The Amish Furniture Guide main page offers full listings of Amish furniture in other states. Note to Illinois residents: Please be sure to check opening hours of any Amish furniture businesses listed in this guide before traveling long distances to visit them. While we strive to keep this directory up-to-date, business locations and availability can change. Not responsible for changes to information. Amish have lived in the Land of Lincoln since the mid-1800s. The Illinois Amish population is dominated by the Arthur Amish community, a sprawling settlement of nearly 30 Amish churches and over 4,000 individuals. Among the still-numerous dairy farms the buzz of saws and pop of air-hammers rings out from myriad unassuming woodworking shops. Amish have established a firm furniture tradition here in the Prairie State heartland, with dozens of workshops bustling with activity 6 days a week. Local Amish craft everything from custom kitchen cabinets to outdoor furniture, gazebos, and traditional indoor furniture including bedroom sets, office pieces such as desks and computer centers, and children’s furniture. Though the area is not as densely-populated a region as that inhabited by their Plain cousins to the east, the Arthur Amish have likewise been on the exit from farming for some decades. Amish in the area pursue alternative occupations besides furniture-making, including home construction, work in local factories, and other small businesses such as metal and machine shops. Yet occupationally, the Arthur community is driven by entrepreneurship, and in particular its many cabinet shops and other wood-related businesses. Entrepreneurship is not limited to males–Amish women run their own small companies, ranging from dry goods stores to a drive-thru coffee shop! Arthur has become well-known as a Midwest furniture destination. Within easy drive of Chicago, Indianapolis, and St. Louis, the area attracts its share of customers from large urban areas. Amish furniture buyers are attracted to Amish-made products for numerous reasons, including quality, value, and attention to detail. Illinois Amish craftsmen create furniture from a range of woods, including hickory, oak, cherry, beech, poplar, maple, walnut, and more. Many shops specialize in built-to-order projects. Others feature set lines of furniture incorporating styles including Mission, Shaker, Queen Anne, and other traditional designs, as well as more contemporary furniture. Outside of Arthur, pockets of Amish can be found scattered around Illinois, with their own small woodworking shops. Amish settlements can be found in roughly a dozen counties in the state, including Jefferson, Jackson, and McDonough Counties. Above all, the Arthur Amish settlement is the center of Amish furniture making in Illinois. But as the listing here demonstrates, you don’t have to travel to this central Illinois community for Amish furniture–with many Amish furniture retailers in and around Chicago, Springfield, Bloomington, Champaign-Urbana, and other Illinois cities. Check out Amish and Mennonite furniture from the comfort of home at Dutchcrafters. Illinois Amish photos by Alice Aber. I would like to buy dining table/chairs and bedroom furniture direct from an Amish furniture maker source in the Arthur IL area. Can anyone provide me with a referrals. There is a Kauffman custom wood interiors in Burbon which is between Arthur and Arcola. Jacob Kauffman started this, who is still Amish. His son who is now running never joined the Amish church, and his dad now works for him. He does have a website you can look at. Also there is Simply Amish close to Arthur that have Amish make furniture, and market it for them. looking for anyone that makes primitive furniture, pie safes, jelly cupboards, dry sinks and the like…. I have a lot, I mean tons, of old timbers and wood. My family was in the heavy moving and rigging business since 1873. We use this wood for housemoving and cribbing. It’s all been stored inside. Most of it is early/first growth wood. Very clear and usually heartwood. Some are 20′ + long. It’s pine and fir, nice stuff. Some of it my great grandfather acquired. Would you be interested in any of it? It’s in Kankakee, Il, about 60 mi south of Chicago. I have CHF and have to get out of the business and am selling everything. I always hoped I would be able to do some woodworking with these great timbers, but my present health precludes that. Hi, In 1999, I purchased a custom dining room table & chairs from “The Amish Furniture Outlet” in Peoria, ILL. I believe they have moved or perhaps went out of business. The table was made in Arthur, IL but I don’t know by “who”. I am wanting to have 2 more table leaves made but not quite sure how to go about doing so. I now live in Charlotte, NC but was planning on going home (ILL) for Christmas and had high hopes of ordering the pieces now and being able to pick them up the last week of December (2013). There is a Simply Amish furniture dealer called Bare Furniture 1660 N. Main Street China Grove N. C. The Simply Amish is furniture made by different Amish from the Arthur area.You could also check with Simply Amish at Arthur. Thank you Marcus and Erik/Amish America! I appreciate you taking the time to respond to my inquiry. I’ll keep you posted should either of those suggestions work out. Cyndi, best advice is just to contact one of the businesses above listed under Arthur or any other convenient-for-you location in IL. Arthur is the largest Amish community in IL. I don’t know what wait times are like for what you want, the only way to find out is to get in touch with some of the businesses listed here directly and see what they can do. I hope it works out for you. I am trying to find out if anyone makes quilt racks anymore, and what they look like and how much they are, the one I saw was about 2 feet wide and rolled the quilt and was long for a king size and had a built in lamp holder but the lady did not know where it was made at.